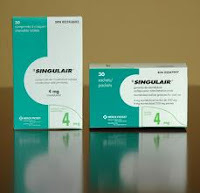 Singulair is a medication often prescribed for asthma as well as allergies and works by blocking the leukotriene receptor. This mechanism is different than that found in common allergy medications like claritin and benadryl which work by blocking the histamine receptor (anti-histamine). Steroid nasal sprays have also been found helpful to reduce adenoid size. However, only an association between singulair use and reduction in adenoid/tonsil size has been found. Double-blind, placebo-controlled studies are required for determination of true benefit. Do you know if there has ever been a followup to this study?